Ignoring the final laps of the Chinese Grand Prix three weeks ago, the whole F1 season could be summarised as Sebastian Vettel being imperious at the front, while a lot went on behind him. This also sums up today's Turkish Grand Prix. It was another diverting race with a lot of dicing, that never gave the viewer a moment's peace, but while all this action was going on Seb remained in command in first place. While a couple of opponents were able to keep him honest Seb never seriously looked in danger of relinquishing his lead and the win. He's got that Ascari/Clark/Senna-esque ability to dominate a race from the front down to a nicety. 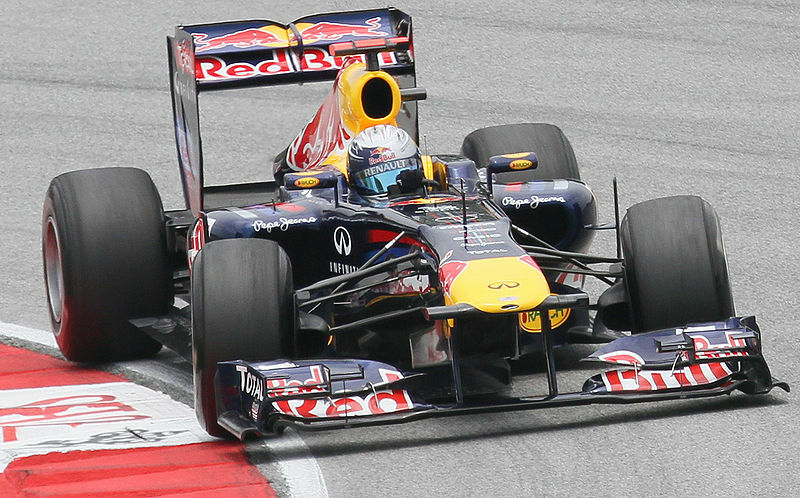 It's now three wins and a second place from four races this year for Seb, giving him 93 points from a possible 100. While we're still in early days, but it's hard to see what can stop him doubling up on his world championships come the season's end. 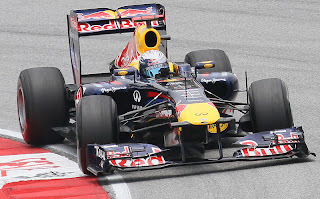 Not even Webber, also in Red Bull wheels, could seriously challenge team mate Vettel today. Though he managed to stay within a handful of seconds of him the feeling persisted that Seb had plenty in hand. The other big story of the race was a red revival. Alonso performed a prodigy to run with the Bulls, and was in second place for a lot of the way, having slipstreamed past Webber into Turn 12, only to lose the place to back in the final stint, against a more freshly-booted Webber. 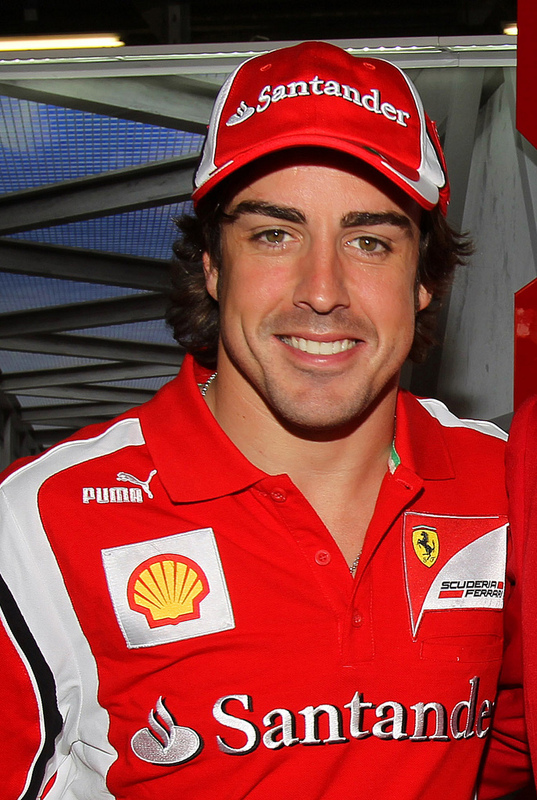 This left Alonso to finish third, but ten seconds behind Vettel. The podium place gives the Scuderia a timely lift, and a big upgrade is due in the next race, at Barcelona. If that works they may yet give Seb something to think about. As for the Red Bulls' other challengers, the Mercedes' race pace feathered away compared with their showing in qualifying (Ross Brawn admitting the car isn't as strong on full tanks). Nico Rosberg was on a rather contrary strategy, and spent most of the first part of the race being overtaken (not helped by blistering rear tyres), before he was able to move forward. Fifth place was his eventual reward. Schumi however put in a cringeworthy performance, not for the first time of his comeback, and you seriously wonder how long he can continue doing this. The McLarens also seemed rather subdued, at a track where they scored a one-two last year, though in the early laps they did give us a reprisal of their intra-team dice seen here last year. They split their strategies, and Lewis's four stopper worked better than Jenson's three, Lewis coming in fourth and Jenson sixth. It'll be more worrying for them that they were 40 seconds down on Vettel and 30 seconds down on Alonso at the end. As in China, the lesson on strategy was that the extra tyre stop is worth the additional grip and pace of newer tyres. Strategies up and down the grid may well settle in that direction. Also, while the DRS still gets a cautious thumbs-up from me, it worked too well in Turkey, allowing competitors to breeze past each other on the main straight like cars on the motorway. The FIA is still learning about how best to apply this new device, but with hindsight the DRS zone should have been shorter here. In general I think it was an interesting race. Nice to see a Ferrari once again on the podium, things seem to be improving gradually at Maranello. I'm not a Ferrari fan, but it's good to see them back. Although Felipe had a so tough race, he was struggling. Something that called my attention during the race, so many marbles on the track. Thanks for your comments Mario. It was an interesting race, at least from 2nd palce downwards! Yes, it would be good to see Ferrari up there consistently, the more teams that are competitive the better. We often forget how strong they seemed in pre-season testing, so hopefully this represents them coming back from their problems to give Vettel a challenge. Yes, I saw the amount of marbles on the track on the slowing down lap - astonishing! I can't imagine what they'd be like to drive on, they'd probably spit you straight off the road!